On Saturday, July 27, two legendary Columbus jazz saxophonists, Rusty Bryant and Rahsaan Roland Kirk, took their place on the Lincoln Theatre Walk of Fame in an induction ceremony sponsored by the State Auto Insurance Companies. The Lincoln Theatre Walk of Fame honors Columbus natives who have made outstanding contributions in their respective professional careers. Attached please find two photos from the event. The image titled “BryantStar” shows Eric Royal Bryant (black shirt on the right), Rusty Bryant’s eldest son, revealing his father’s star surrounded by Rusty’s grandchildren, nieces, and nephews. 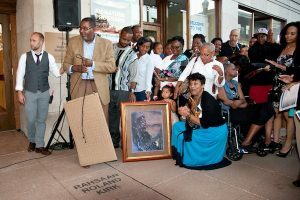 The image titled “KirkStar” shows Rory Kirk, Rashaan Roland Kirk’s only son, revealing his father’s star with Rashaan’s sister Candace Kirk Howell (woman to right with white top and glasses). Born in Huntington, WV, in 1929, Royal G. Bryant grew up in Columbus and became an important part of the local jazz scene by his early 20s. He first worked as a sideman with Tiny Grimes and Stomp Gordon, then led his own bands before signing with the DOT label and landing a major R&B hit with “All Night Long,” a double-time cover of “Night Train.” Bryant soon returned to Columbus where he later recorded on Groove Holmes’ classic, “That Healin’ Feelin’,” and 1969’s Rusty Bryant Returns. His next albums, Night Train Now, Soul Liberation, Fire Eater, and Wildfire became cult classics among acid jazz aficionados for their strong, funky grooves. Bryant died on March 25, 1991. Rahsaan Roland Kirk was born in Columbus in 1936 as Ronald Theodore Kirk, and went on to become one of the most unique and colorful saxophonists of his generation. While Kirk was born with sight, he became blind at the age of two. At the Ohio State School for the Blind, he experimented with a variety of instruments, from the bugle to the trumpet and clarinet. As a teenager, Kirk picked up the tenor saxophone and began playing in rhythm and blues bands around the Columbus area. His style of playing multiple reeds has been emulated by several contemporary saxophonists, and he mastered circular breathing, a technique enabling him to play without pause for breath. He was renowned for his onstage vitality, during which virtuoso improvisation was accompanied by comic banter, political ranting, and the ability to play several instruments simultaneously. Kirk suffered a stroke in 1975, leaving one side of his body paralyzed. He continued to perform and record by playing one-handed until his death in 1977. 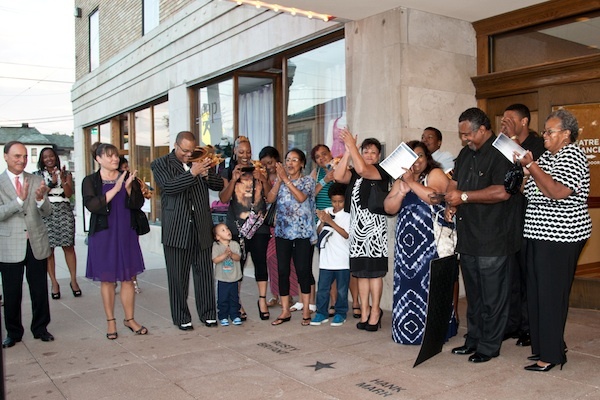 First opened in 1928, the Lincoln Theatre is a landmark in African-American and jazz history. After undergoing a $13.5 million renovation funded by a partnership of public and private support, the Lincoln reopened in May 2009 as a multi-use, state-of-the-art performing arts and education center serving the diversity of the Columbus and central Ohio community and its resident Columbus arts organizations. The restoration is the foundation of revitalization plans for the King-Lincoln District, providing a bustling hub of activity 365 days a year with performances, rehearsals, and classes in the performing arts, as well as a wide variety of community events such as film festivals, meetings, and receptions.